UPDATE: In May 2011, Canadian researchers found bed bugs with Methicillin-resistant Staphylococcus aureus (MRSA), bacteria that is highly resistant to antibiotics and can cause infection in people with compromised or weak immune systems. See their findings at Bed Bugs as Vectors for Drug-Resistant Bacteria. Many of us consider “Night, night, sleep tight, don’t let the bed bugs bite” a quaint nursery rhyme no longer applicable in the 21st century. Not so. Bed bugs are making a major comeback in part due to increasing international travel and resistance to pesticides. So far, there is no evidence that bed bugs transmit infectious diseases. However, coming into contact with these pesky insects during your trip will cause physical discomfort and psychological stress. Getting rid of bed bugs will take time and undoubtedly test your stress coping abilities. In fact, persons suffering through a bed bug infestation commonly have symptoms of anxiety and depression. Bed bugs don’t fly, but are very quick and squeeze easily into cracks and crevices. Both male and female bite at night, feeding on human blood. They live for about one year, but they can survive without feeding up to 6 months, sometimes longer. During the feeding, the bed bug injects saliva causing skin irritation and inflammation. Scratching the bite area causes a rash, and can progress to swelling and red welts on your arms, legs, face, and chest area. Try not to scratch and keep the skin clean to prevent infection. Calamine lotion helps relieve the itchiness. Talk to your doctor about getting a prescription for antihistamines for relief as well. Since bed bugs are nocturnal, you most likely won’t see them. However, their eggs and feces betray them. Look for clusters of feces (black / brownish dots) and eggs (whitish, the size of a pinhead, in clusters of 10-50). 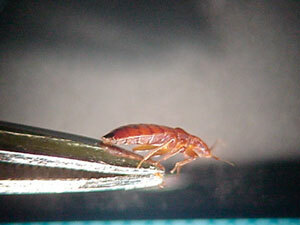 An adult bed bug has a brownish pear shaped body and typically measures ¼ inch or 1.9cm long. What is fascinating is that its body can change dramatically: Before feeding a bed bug can be as thin as paper, but after feeding it becomes bloated. 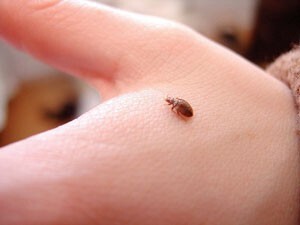 Bed bug on a person’s hand. Bed bug on a tweezer. 1. Learn about bed bugs and their behaviour. Bedbugger.com has photos and a wealth of information about the insects. 2. Consult The Bed Bug Registry or Trip Advisor to see if other travellers have reported suspected bed bug infestations where you will be staying. Keep in mind though, that these reviews may not be reliable since they are not corroborated by an independent third party. 3. Bring clear or opaque plastic bags that can be properly sealed for worn clothing / laundry and to wrap your luggage. You can find extra large plastic bags at your hardware store. 4. You may want to bring a permethrin-treated bed net. Bed net protection will not work if the mattress is infested with bed bugs. 2. Don’t unpack your clothes from your suitcase. Place your luggage in the bathtub or shower stall. If there is no washroom adjacent to your room, place your luggage in a large clear plastic bag and keep it away from the bed and the floor. 3. Place all clothes for laundry (including your pajamas) in a tightly sealed plastic bag to contain potentially affected clothing. To avoid escaping bed bugs back home, sort laundry in colours and place in separate plastic bags so it’s easy to load the washing machine. 1. Place your luggage in an isolated part of the house, such as your garage or porch. Thoroughly inspect the suitcase and all articles of clothing that are not sealed in a plastic bag. 2. Wash your clothes using the hottest machine setting (washing at high temperatures will kill the eggs). Some fabrics will not be able to withstand hot water, so dry-cleaning may be an option. Don’t forget to warn the dry cleaner about a possible bed bug problem. 3. Dry your clothes at the hottest setting for at least 45 minutes. 4. For suitcases and larger items that cannot be put in the washer or dryer, you can wash them with hot water (at least 37.7°C – 48.8°C or 100°F – 120°F). Use a scrub brush for the seams. 5. Items that can’t be washed can be heated or frozen. If using extreme heat, the item has to be exposed to a minimum of 45°C or 113°F for at least two hours. If you freeze the item, it should be at a minimum of -5°C or 23°F for at least 5 days or can be flash frozen at -26°C or -14.8°F. For more information, the University of Minnesota has useful guidelines. If you suspect that you brought back bed bugs with you, contact a pest control company for a consultation. They will have tips on how to get rid of them and suggest a treatment schedule. There are a variety of options out there (but also a lot of misinformation) on both toxic and non-toxic extermination methods. Talk to a professional or a person who has successfully stopped bed bug infestations at home. Resources are out there – the key is to be consistent and thorough.